The oldest known lizard footprints show the animals ran on two feet, confirming a long-held view among researchers. 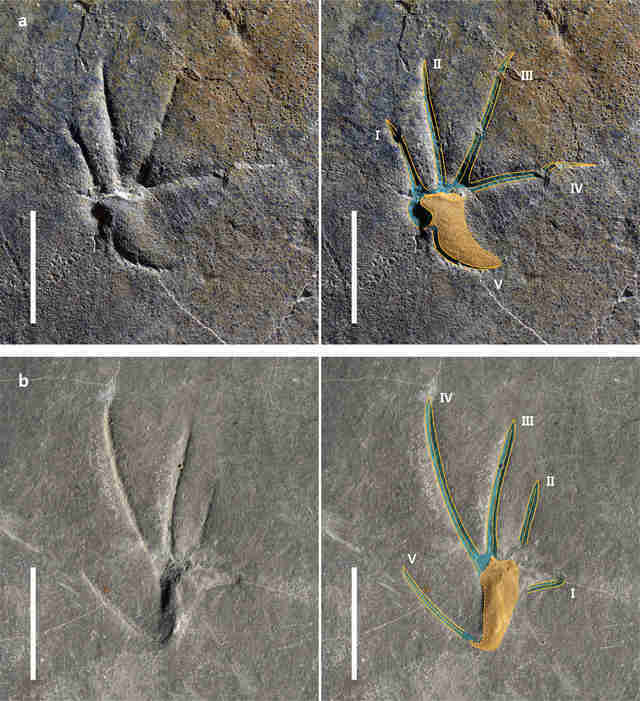 W	W	hile searching for dinosaur bones in August 2004, vertebrate paleontologist Yuong-Nam Lee found some ancient footprints for a pterosaur and other small animals. He was studying pterosaurs at the time, so the tracks left behind by the other species were not of much interest. Lee placed the mudstone slab containing the tracks in the Geological Museum of the Korea Institute of Geoscience and Mineral Resources, where it remained in storage for 12 years. Lee returned to the slabs two years ago with fresh eyes and dated the four series of trackways to between 125–100 million years ago. Then came a eureka moment. "I was very excited, because they represent the oldest lizard tracks in the world," Lee told Seeker, clarifying that the footprints are actually about 110 million years old. He showed the tracks to some colleagues, including Anthony Fiorillo, chief curator and vice president of research and collections at the Perot Museum of Nature & Science. "Initially we thought that these were indeed very interesting early lizard tracks, but then we realized that they provide evidence for lizards running on their hind feet," Fiorillo said. "That realization made the discovery even cooler." The trackways, reported in the journal Scientific Reports, provide the first direct evidence for bipedal — or two-footed — running in fossil lizards. What's more, they suggest that the lizard could have been running away from a pterosaur during the Cretaceous Period (145.5–65.5 million years ago). Prior studies on fossilized lizard skeletons indicated that early reptiles might have run on two feet, but no one was really sure. "That's what is so important about trackways," Fiorillo said. "They actually record a behavior." Lee, Fiorillo, lead author Hang-Jae Lee, and senior author Junchang Lü determined that the lizard was close to 2.5 inches long. They cannot tell exactly how fast it was running. "However," Lee said, "modern lizards can run quite quickly. For example, the Costa Rican spiny-tailed iguana can attain a sprint speed of 34.6 kilometers per hour (21.5 miles per hour), which is about as fast as a charging grizzly bear." Basiliscus basiliscus, aka the "Jesus lizard," can even run on the surface of water. Based on early skeletal material in the fossil record, the scientists suspect that the running lizard came from an extinct family of Iguania. They identified the prints as Sauripes hadongensis, which refers to the group of fossilized lizard tracks and not to the precise species, which remains unknown for now. Since the fossils are very well preserved, the researchers were able to study the lizard's foot anatomy in detail. They identified 25 footprints showing typical lizard anatomy with curved digits increasing in length from the inside of the foot to the outside, and four shorter handprints with a longer third digit compared to the other four digits. The authors found that the footprints were predominant, which is more consistent with a two-legged, rather than a four-legged, gait. Increasing stride length and other aspects of the tracks suggest that the prehistoric lizards were running on their toes. Tracks for carnivorous non-avian dinosaurs were also found at the site, what is now the Hasandong Formation of South Gyeongsang Province, South Korea. The dinosaurs were, Lee said, "probably too big to worry about catching tiny lizards." Nevertheless, being a small animal surrounded by much larger species — many of which were meat-loving — must have been a challenging existence. The pterosaur Pteraichnus koreanensis, which could have preyed upon the prehistoric iguana-like lizard, was a small and agile predator with sharp teeth and large eyes. 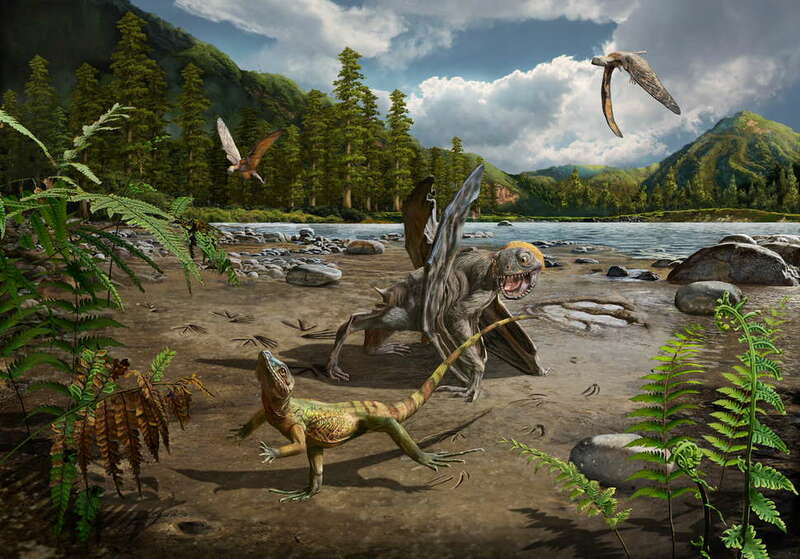 The pterosaurs "could have attacked prey from the air, like some birds do," Lee said. The lizard, with its longer muscular hind limbs and shorter forelimbs, somewhat resembles a miniature Tyrannosaurus rex. But Lee said that there is no close common ancestor shared between lizards and dinosaurs. Any resemblance is therefore due to independent evolution. Non-avian theropod dinosaurs like T. rex had fully erect legs, while lizards maintained a sprawled posture when they ran. Carnivorous dinosaurs exhibited obligate bipedality, meaning that their evolution restricted them to two-footed navigation. The ancient lizard's bipedality was more passive, such that it could likely switch from being four-legged to two-legged, depending on its needs. The early iguana-like lizard probably evolved this unique way of moving so that it could move as fast as possible away from predators. The genetic structure of lizard ancestors did not allow them to evolve four more evenly-sized muscular limbs, as with many mammals that can run fast. Running on two-limbs could also have allowed the lizard to hold its head upward, keeping a closer eye on tall or aerial predators like pterosaurs. Bidedality in humans probably evolved more as a response to environmental changes. The primate ancestors of humans are thought to have lived in forested regions, where they spent much of their time in trees. "The environment changed to more open areas that, among other things, changed the distribution of food," Lee said. It is unclear how often the earliest bipedal primates ran. They were surely pursued by predators from time to time, and might have legged it for other reasons, such as escaping other natural threats or desiring to move quickly over long distances in non-threatening situations. For now, it is also a mystery as to how often prehistoric lizards ran, and how many lizard species evolved the ability to do so on two feet. Lee said, "Finding more tracks like these will help us understand how prevalent this means of locomotion is within early lizards."